Starting this January, the UC Santa Cruz Linguistics Department is offering a course on made-up languages for the first time. Students will study the history, purpose, and structure of invented languages. Nick Kalivoda, a Ph.D. candidate in linguistics at UC Santa Cruz, is teaching a course called "Constructed Languages from Elvish to Esperanto." Photo by Carolyn Lagattuta. In Star Trek, hulking warriors speak Klingon. In Lord of the Rings, ancient forest dwellers talk in Elvish. And in Game of Thrones, nomadic tribes chatter in Dothraki. These made-up languages evoke fictional worlds. Now, fans can learn more about the magic behind all those invented words and phrases by immersing themselves in the history of constructed languages. Starting this January, the UC Santa Cruz Linguistics Department is offering a course on made-up languages for the first time. Constructed Languages from Elvish to Esperanto will give students a chance to study the history, purpose, and structure of invented languages. In the process, students will gain a deeper knowledge of how languages work and insights into how languages can be crafted for different purposes. Though this class has never been taught before, it is not UC Santa Cruz’s first connection to invented languages. Alumnus Mark Okrand (Stevenson ’70, linguistics) created the Klingon language for several Star Trek movies as well as Star Trek: The Next Generation and Star Trek: Deep Space Nine after studying linguistics as an undergraduate at UC Santa Cruz. He also holds a graduate degree in linguistics from UC Berkeley. Experience making up a language is not required for the course, but it may help. 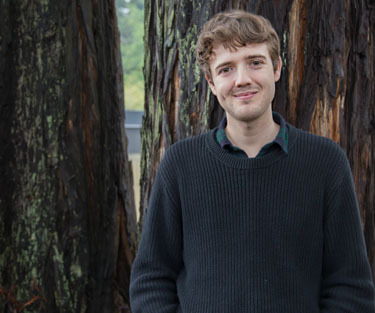 “I’ve met a lot of people who made up a language when they were younger and make their way toward linguistics (because of this),” says course instructor Nick Kalivoda, a Ph.D. candidate in linguistics at UC Santa Cruz. Kalivoda’s own introduction to linguistics came in high school when he invented a language. He then began learning Esperanto, a constructed language that has more than 2 million speakers. Why make up a language? The course will explore the reasons for making up new languages. For some people, it is an enjoyable way to test the limits of communication. For others, made-up languages enhance imaginary worlds. As a linguistics student, Klingon inventor Okrand learned concepts that help him design a fictional language for a non-human species. By learning common features of spoken languages, Okrand devised a language with distinctly alien characteristics. “Once you have learned a little about natural languages, it gives you a menu of options to pick from when you design the structure of your language,” Kalivoda explained. Language creators can also use this principle to give their language a history. When Lord of the Rings author J.R.R. Tolkien created Elvish, he developed it from an ancient fictional language he had created. In the process, Tolkien established that Elvish had splintered away from this older, made-up language. In doing so, Tolkien added a rich historical context to the world of Middle Earth. Some made-up languages can add heft to fantastical creations, but others have more pragmatic uses. L.L. Zamenhof, inventor of Esperanto, wanted it to be an ideal second language for people all over the world; the structure was so simple, anyone could learn it. These days, it is the most widely spoken constructed language in the world. Zamenhof came from an ethnically and linguistically diverse region of what is now Poland. Tensions between the residents ran high, in part because they spoke a babble of different languages. Hoping to ease these tensions, Zamenhof designed Esperanto to put all the speakers on equal footing. In conversation, no one would have an edge on anyone else because anyone could learn it. Aside from this, Esperanto is politically neutral, a language without a country. Being an Esperanto speaker, or Esperantist, has come in handy for Kalivoda. When travelling in Iceland one summer he met two friendly travelers, one Italian, the other Slovak, neither of whom spoke much English. The three spoke Esperanto. Linguistics 80K will be offered Winter 2017 and Summer 2017, session two. There are no prerequisites for this course. It satisfies the textual analysis (TA) graduation requirement.